Whether for your home lawn, commercial landscape, park, or golf course, there is a lot of information out there about sprinkler systems that will help you choose the right system and features for your needs. And because sprinkler systems and overall irrigation supplies can be an investment, it’s a good idea to know as much as you can before you make a purchase. Kern Turf Supply has a large selection of irrigation supplies, a variety of different types of sprinkler systems, and our experienced and knowledgeable team can help you make the right choice for your lawn. We have been providing Bakersfield and Southern California with quality products and service since 1958 and we are dedicated to ensuring that our customers get the most efficient and cost-effective systems available. Above-Ground: These systems are comprised of sprinkler heads that are attached to a hose. Hose splitters allow users to water different parts of the lawn at the same time. Above-ground sprinkler heads are simply screwed on to the end of a hose. In-Ground: These are often automated systems that are installed by a professional. There is a main line that is connected to different branches, each with their own sprinkler head. In-ground sprinkler heads have various shapes, sizes, and bodies that create different water streams or spray patterns. Fixed: A fixed sprinkler head remains stationary, but will have streams of water that can be adjusted to target a specific area surrounding the head. For example, you may want to water an area next to a walkway. The sprinkler head can be adjusted to spray only in a 180-degree pattern to avoid watering the walkway. Fixed sprinkler heads can be customized for a smaller 40-degree range all the way to a full circle, depending on your needs. The water can reach between three and 15 feet depending on the water pressure. Impact: These are typically made with bronze or brass, making them a sturdy choice, but they also tend to require more maintenance. These are able to spray between 20 and 150 feet. Gear-Driven: These of often made with plastic parts, making them a more affordable option. The moving parts are inside the body, making them quieter than impact sprinkler heads and the can spray between 18 and 55 feet. Turf Rotor: These are used most often in golf courses and can spray up to 100 feet. Misting Systems: A more cost-efficient system, misting irrigation supplies are typically used for smaller gardens. Misting sprinkler heads use less water and are also good for areas with clay-based soil as they provide a smaller amount of water over a longer period of time. In-ground irrigation systems have heads that rise up when in use and retract into the ground when not in use. When shopping for a sprinkler system and different heads, look at how high the head rises. Two Inches: This height is great for backyards where grass it kept short and the water can be sprayed between three and 15 feet. Four-Six Inches: These are used for grassier areas when the blades aren’t cut below three inches. When the grass grows longer, the head will still rise higher and can still function. Eight-20 Inches: Taller sprinkler heads are great if your lawn has taller grasses, plants, shrubs, or rock features and the water can still reach above these obstacles. If you need to give your sprinkler head some height, but prefer to not have the pop-up version, you can opt for a PVC vertical riser. These will allow the water to spray over retaining walls. Keep in mind, though, that when these are used in open areas, they may create a tripping hazard. It’s also important to consider that the sprinkler head may settle into the ground over time. If you need a clearance of four inches, you may want to purchase a head that is six to 10 inches. This will ensure that even as the head settles into the ground, it will still be effective in watering the area. You will also want to consider the size of the lawn as you’re shopping for irrigation supplies. For smaller lawns, pop-up sprinkler heads are effective because the water doesn’t need to reach as far. For larger, commercial lawns, look for sprinkler heads that have a longer reach. You can also think in terms of irrigation zones, and which areas need more or less water. The grassy yard may need more water than the flower garden. Landscaping experts often refer to how much water a sprinkler head can deliver in gallons per hour (GPH). Thinking about how much water each zone requires will ensure that your sprinkler system is as efficient as possible. 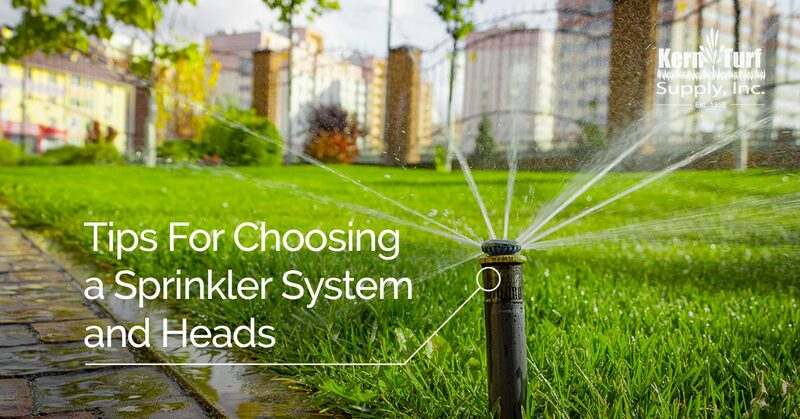 If you need further advice or resources to help you select the right sprinkler system and head type for your needs, get in touch with Kern Turf Supply in Bakersfield. We have everything you need to create and maintain a beautiful lawn.